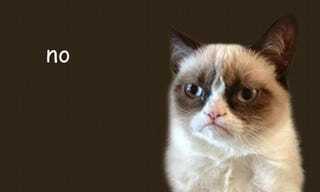 The Express is reporting that Grumpy Cat—also known as Tard to longtime fans—has generated her owner Tabitha Bundesen over $100 million. Sure, okay! That's great and all, but we're pretty sure cats — especially those suffering from medical conditions like feline dwarfism — would prefer a nice dish of wet food and a new catnip toy to a mountain of cash. Yeah, I don't know, I guess? Cats enjoy food and toys. I don't think Grumpy's notoriety is mutually exclusive with that, or that the cat has really suffered at all from the fame. When Jezebel visited Grumpy in San Francisco, it was "abysmal" not because of a stark situation in which a cat is forced into servitude, but because he wasn't allowed to interact with the cat at all. The cat slept on a pillow, mostly out of reach to everyone, its tired owners in the corner making perfunctory responses to inane press questions. It's just a darn cute cat who found fame because of some images posted on the internet. She's not a slave to anyone—she's just a cat. Cute cats are fun to look at. I like cute cats. You don't need to save Grumpy from a life of servitude that mostly involves sitting, sleeping, sleeping in other places, and being photographed. You can be jealous of the money that the popularity has generated, I suppose, but there's no reason to pity the cat or to be angry about the money. I have enough faith in her owners to believe that she's not suffering, and neither are we by seeing the internet festooned with her image; if you roll your eyes at the movie or the giant billboard with her face or her hundred million dollars, as if you're far above such a low denominator of entertainment, then you are the grumpy one. If you want to ignore the cat, ignore the cat. If you like the cute pictures, then enjoy them. Just don't be such a sourpuss.